Limit the amount of baths you give your dog and use a moisturizing shampoo. Shampoo baths can be hard on your dog’s skin anytime of the year, so during the winter months it won’t hurt to limit bath time to only when completely necessary. A lot of times a simple water bath will suffice, rather than lathering your dog up with shampoo. However, you should invest in a good moisturizing shampoo to use during the winter months to help prevent any problems with your dog’s skin or coat. Your dog’s diet plays a huge role in the condition of their skin and coat. Feeding your dog a healthy diet year round can help your dog enter into the winter months with healthy skin and a nourished coat, which can help to prevent your dog from falling victim to the havoc of frigid weather. If you already know that your dog has sensitive skin and is susceptible to problems, you should consider feeding them a recipe that is designed specifically to nourish their skin and coat. Holistic Select carries many recipes that are complete with ingredients to improve skin & coat. Use an air humidifier near your dog’s bed at night. While you cannot control the outside temperatures, and you cannot keep your dog indoors all the time – after all, she has to go outside to relieve herself – you can maximize your indoor air with humidifiers and fans to keep the air circulating so that allergens are not collecting in the air and carpets. To keep everyone comfortable, both pets and people, avoid as much as possible using room deodorizers, scents, or carpet and furniture cleaning products, as these products can be hazardous to sensitive skin. Consult with your veterinarian if you notice symptoms of a possible skin condition. Cold weather isn’t the only culprit that can cause your dog to experience skin irritation. Other potential causes of skin conditions can come from sources such as parasites, underlying health issues like kidney or liver problems, or hormonal or nutritional imbalances. If you notice that your dog is scratching excessively and is obviously experiencing discomfort, you will need to have him examined by a veterinarian so that more serious health issues can be ruled out. Don’t leave your dog or cat outside in the cold weather for extended periods of time. Whether or not your pet is prone to sensitive or dry skin during the winter months, no dog or cat should be left outside in extreme cold weather conditions. 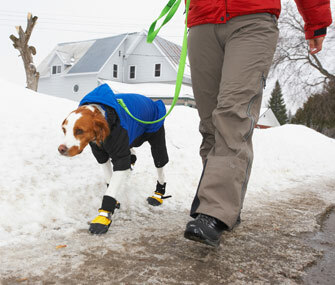 It is important to take your dog out and give him the exercise that he needs during the colder months, but you shouldn’t leave him out in the cold during frigid weather. Brush your dog’s coat on a regular basis. Using a soft brush on your dog’s hair coat will help to stimulate the hair follicles and natural oil glands in the skin, and remove any patches of skin as you brush across the surface. Removing the dead skin cells and loose hair from the coat will allow the skin a chance to repair itself naturally. We hope that you and your pets enjoy the holiday season and you both stay warm and healthy this winter!